The week started out with full storm in the higher mountains. The wind was quite noticeable on the coast as well. The pipe hat on the roof sounded like it would take off any minute. For some reason that I can’t explain, I chose Hidsegga as my afternoon hike. The mountain is extremely exposed and I’ve had some rough weather experiences on this mountain before. Adding darkness to the equation makes it even more interesting. 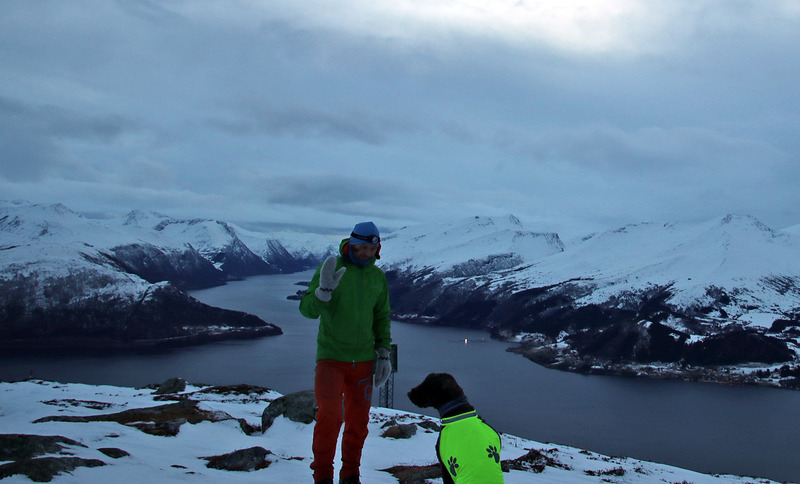 We headed up the Hidsdalen road and followed the marked path up to the west ridge. There was snow, but it didn’t cause us (the dog and I) much problems. Once we topped out on the west ridge, the wind was quite strong and when we reached the summit cairn, it was really strong. And cold. Very cold. This was no place to stay, so after a couple of pictures, we rushed down the same way we came. Tuesday afternoon was wonderful, although a bit cold and windy. But I was in the mood for a ski-trip and chose to go to Melshornet. I remember that a friend told me that they had a prepared track all the way to the top. Which would be good for the dog. I parked at Helgatun and sure enough, there was a motorway up the mountain. To my disappointment, it seemed that Karma was happier in the forest and the deep snow than on the track. The ascent went fairly quick. It took us only 40 minutes to ascend the 3km+ and 590 vertical meters. 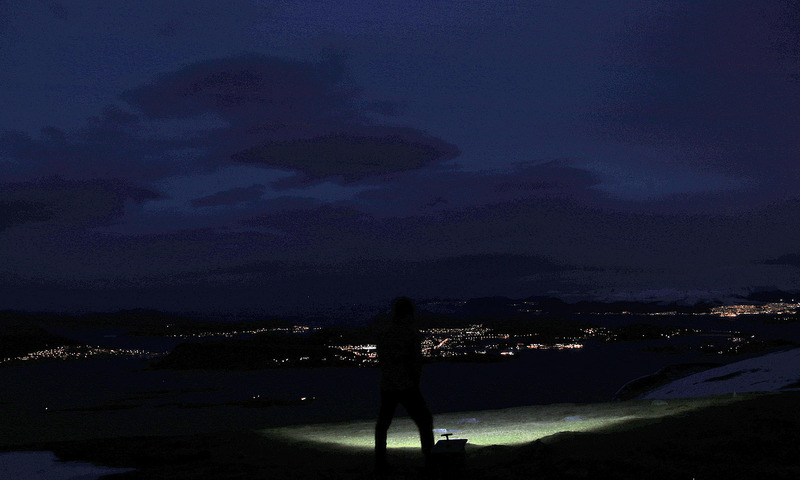 It was freezing cold up there, and when I had to change batteries on the GPS and on the headlamp, my fingers ran into to trouble. I was super happy when we finally could begin the descent. We headed out and my ambition was to beat my 50 minute personal record – on a path with no ice. The spikes helped some, but not really in the downhills. 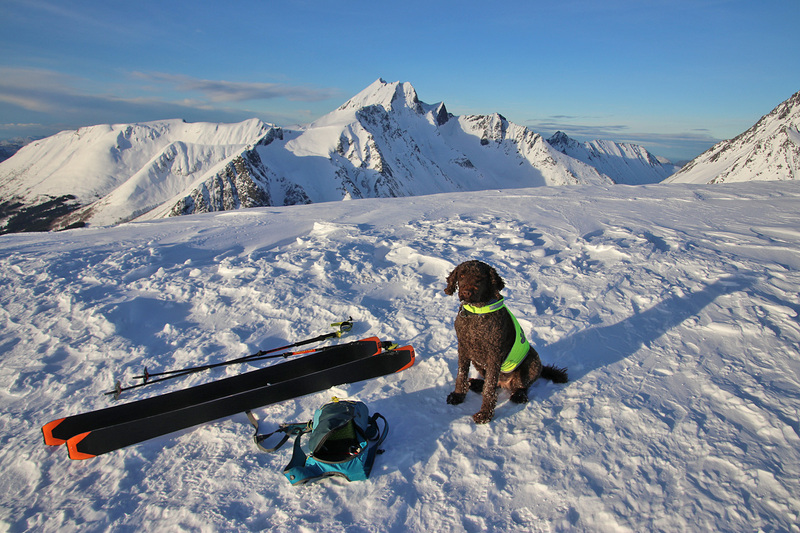 By the time we got to the stairs below Fjellstua, Terje started to lag behind. An at Rundskue (the high point), I had to take a couple of rounds around the lookout tower so that we could do the rest of the run together. 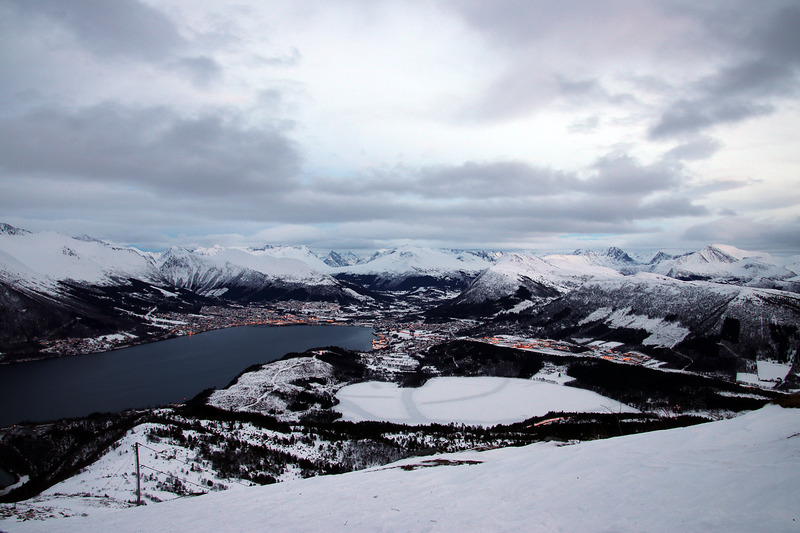 The plan was to hike Sulafjellet (778m), but when I arrived at Langevåg, it started snowing. I knew that the upper mountain would not be a good place to be in these conditions, so I abandoned Sula and took the ferry to Hareid instead – on my way home. 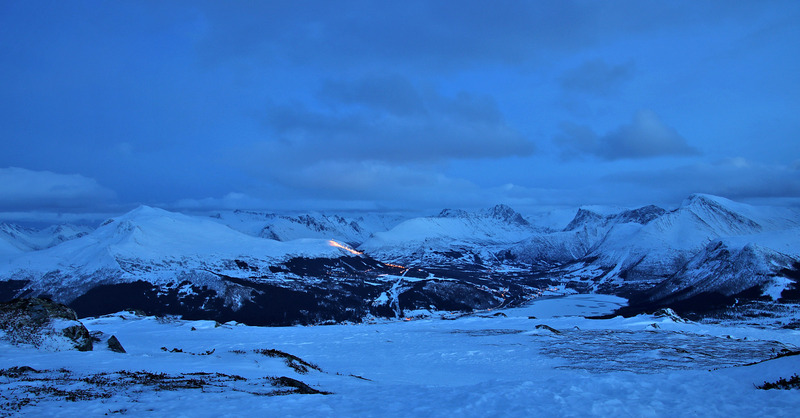 In Hareidsdalen, it wasn’t snowing, and I decided to hike Hovdenakken. 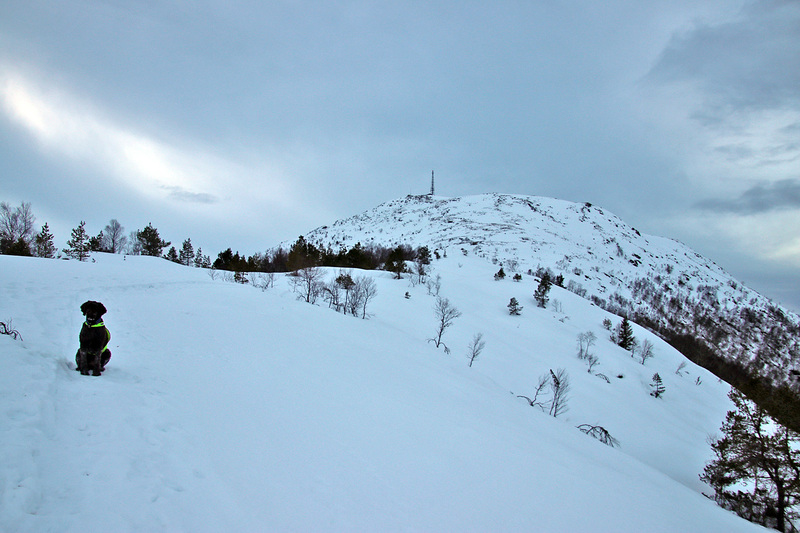 I started from the golf course in Hareidsdalen and had to struggle in deep snow on the way up the northeast ridge. And then it started to snow. 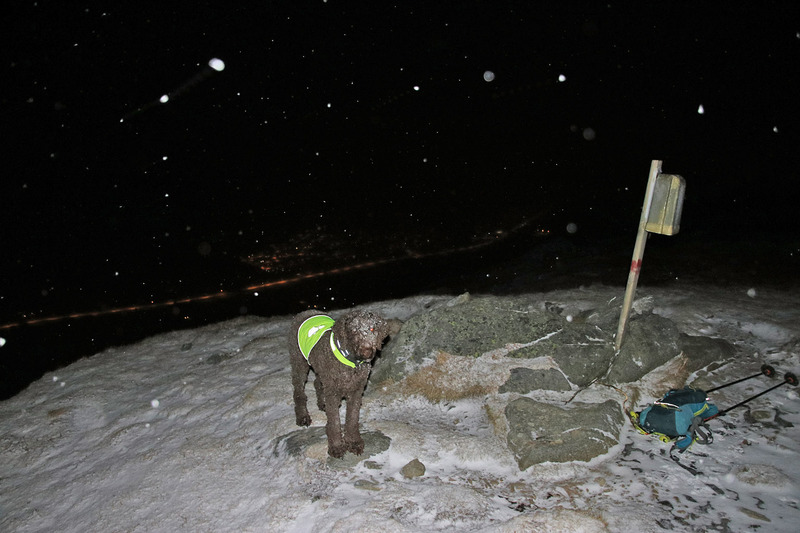 It was dark when we reached the top, and the snow shower had almost passed. 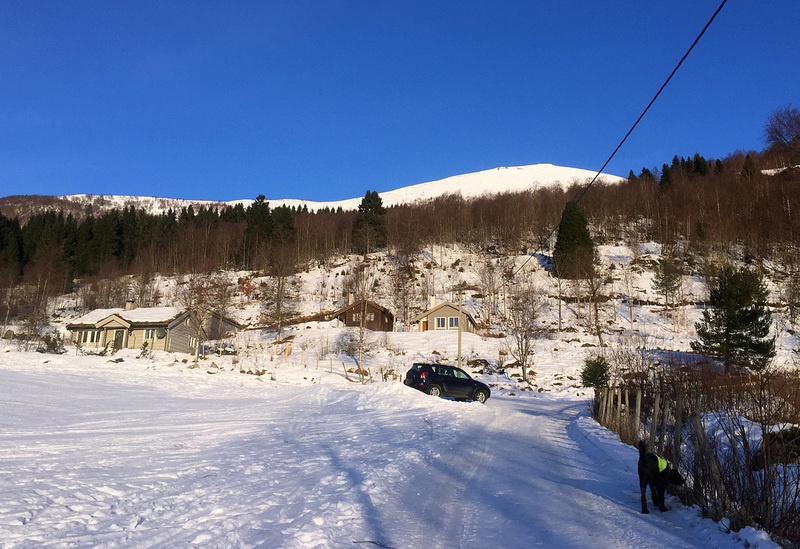 I decided to return via the Fjelle road and along RV61 in Hareidsdalen. 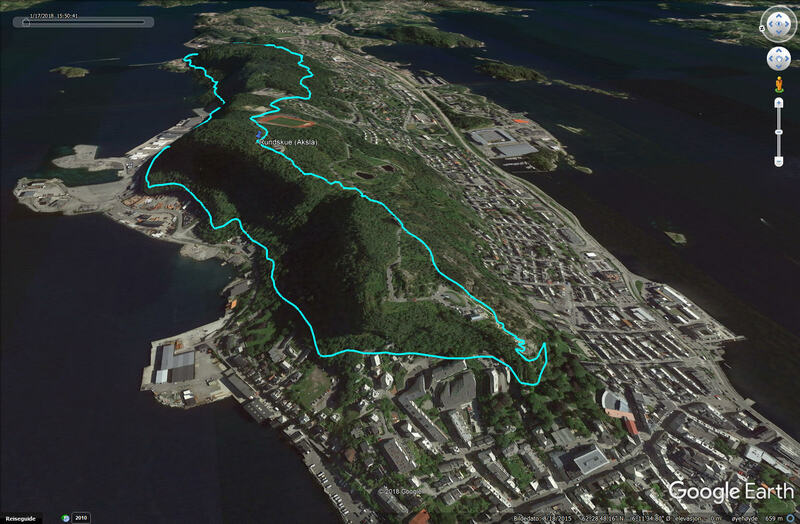 Once on the Fjelle road, I started to jog and continued jogging all the way back to the car. Not so fun in hiking boots! The round trip was exactly 10km. 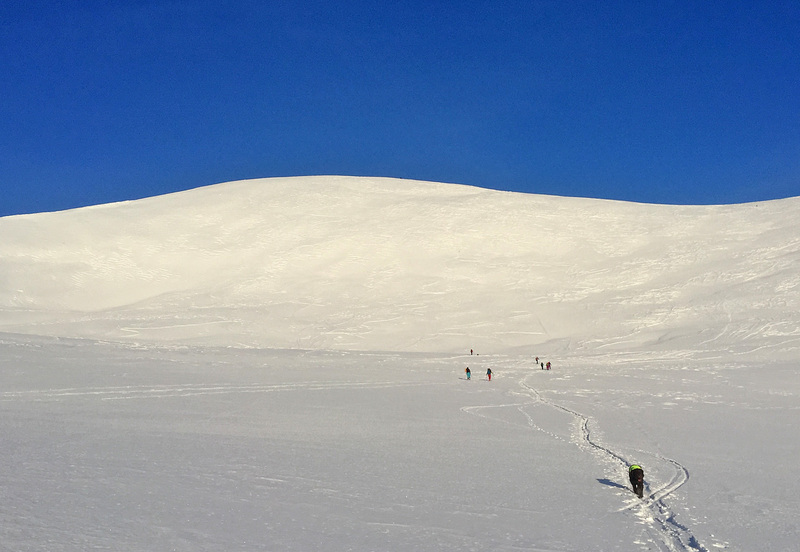 Helgehornet is one of the mountains where you in winter can rely on someone else having broken the trail. And when I heard that a friend reported good conditions, I decided to go there. I forgot to check which route she took. 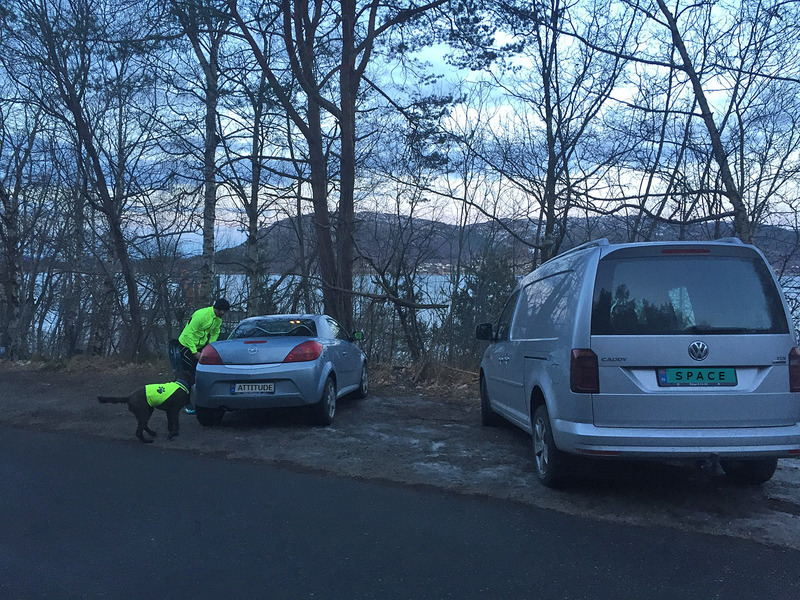 I parked at the south end of the tunnel by Hovdevatnet and could see that there was a well worn path from the parking. The path joined a forest road which took us up to the thicker forest. I was happy to see that the well worn path continued into the forest. After a while, we got the mountain in view. It was windy on top, and stopping for pictures was not fun. 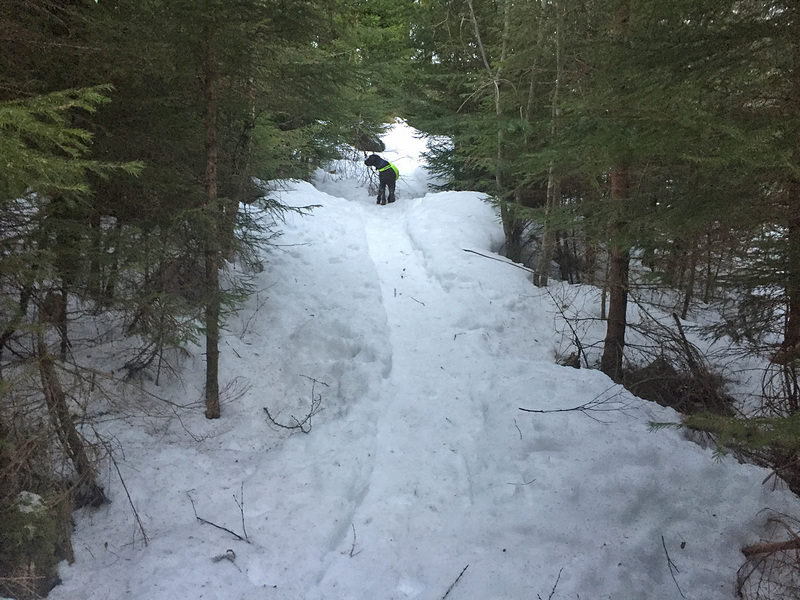 I noticed snowshoe tracks leading down the south ridge and decided to make this a round trip hike. The tracks vanished, but they seemed to follow the marked route (sticks). By the time the snow began to cover the sticks, I could see the tracks again. 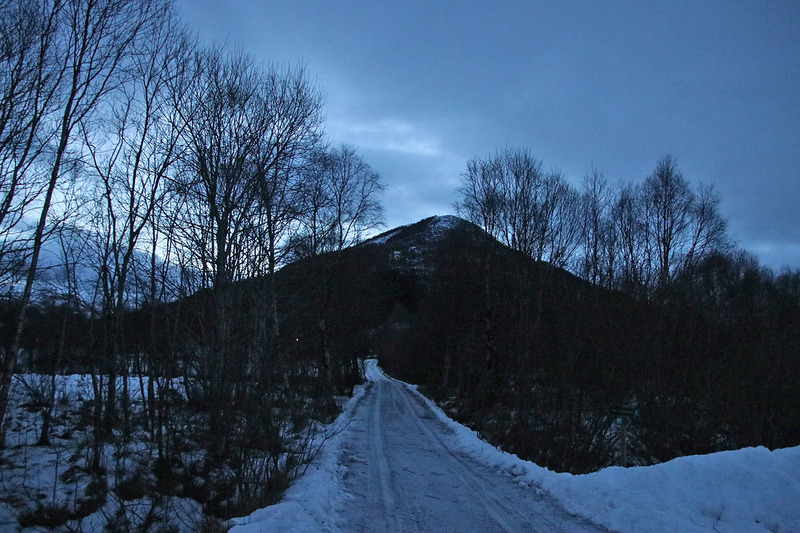 In Sollidalen, the tracks went to the right, while I wanted to go left – towards the gun range. So I had to break my own trail before we got to the road to Kleiva. Once on the road, we followed it back to Hovdevatnet. It was a nice 8,2km round trip hike! Saturday, and I really wanted to go somewhere and hike or ski a new mountain. But this would mean a long travel, and as I had to work in the morning and in the afternoon, this would be very difficult. But after 3 hours of work, I had a 5 hour break before having to work again and decided to ski Sandhornet. The weather was gorgeous and even I didn’t expect the snow conditions to be equally gorgeous, I very much looked forward to the trip. Karma and I headed out from Brudavollen and we took the short-cut up the forest. 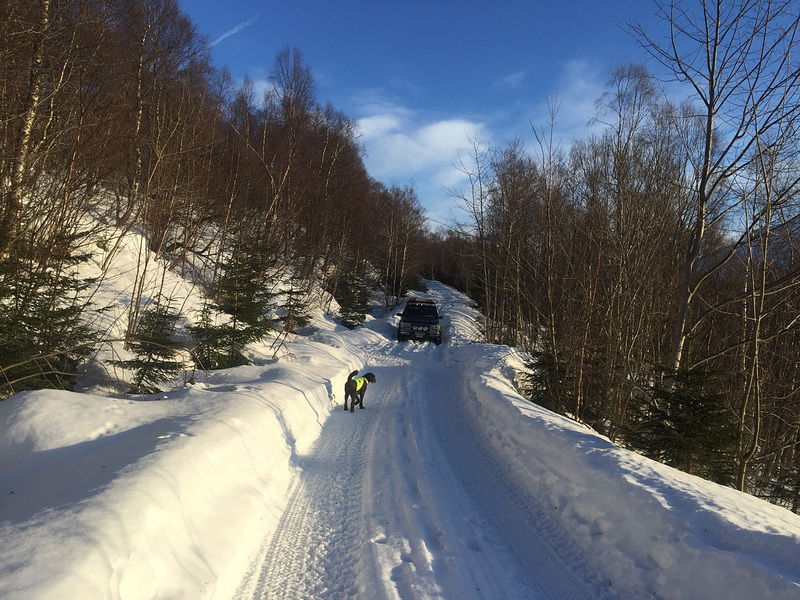 Once on the forest road, I was pleased to see that it was neither icy nor had deep tractor tracks. It could be skied down! Above the forest, it was no big surprise to see that there was a good track up the mountain. This meant a quicker ascent for me, and a more enjoyable ascent for Karma. I passed 4 other skiers on the way up, and I was wondering why there wasn’t more people here on such a brilliant day. This is the default skiing mountain for a lot of people in this region. It took us 1 hour and 9 minutes to ascend the 820 vertical meters. It was windy (of course), and it felt really good to change shirt and put on a dove jacket while taking pictures. On the way down, I passed the 4 skiers and could see a small armada of other skiers on their way up the mountain. 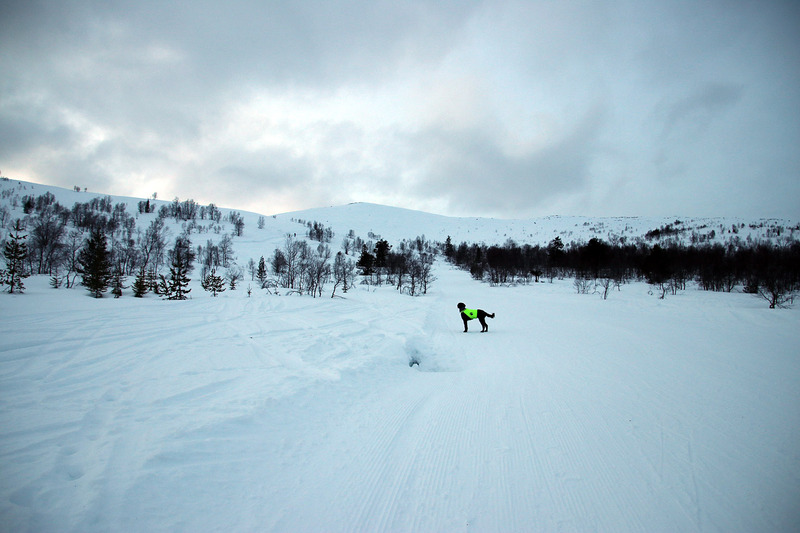 The snow was terrible and I am not a good skier in difficult conditions. Well, I’m not really a good skier anyway, but look less bad when the snow is soft. Karma had to run 4,3km downhill, but every time I stopped to check if she needed a break, she looked eager to continue. We were back at the trailhead 1h:50m after leaving it, and plenty of time left before I had to go to work again.